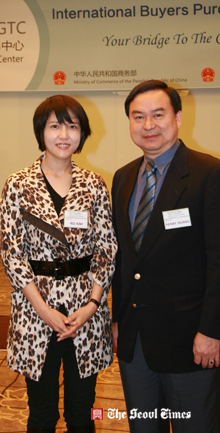 Mr. Henry Hwang (right), chief executive officer of Business One Global Trade Center, poses with President Rei Kim of NexFair in Seoul on April 20, 2012. "Chinese market is open and China is an opportunity for the Korean businesses," said Mr. Henry Hwang, chief executive officer of Business One Global Trade Center, the organizer of "International Buyers Purchasing Conference 2012" to be held Linyi in China's Shandong Province on June 2-6, 2012. Mr. Hwang briefly visited Seoul for the presentation of the conference for the local buyers and media held at on April 20, 2012. Mr. Hwang said that "International Buyers Purchasing Conference 2012" will be the world's largest prearranged meeting and trading platform for Chinese buyers and foreign sellers of different product categories. He said that the conference will be organized by Business One Global Trade Center (GTC) headed by himself. Major Chinese buyers and international manufacturers will be invited to the five-day conference. The conference will cover such products as food and beverage (F&B), health supplements, consumer electronics, toys, stationery, gifts, cosmetics and beauty, and furniture. Mr. Hwang quoted the data from the Chinese Ministry of Commerce when he said that the total volume of retail sales of China reached 15.45 trillion RMB in 2010, with an annual increase of 18.4 percent. He said that China has a vigorous demand for imports as she is the world's second largest consumer market only after the Unites States. He predicted that China will soon become world's largest market. Mr. Hwang also said that South Korean products are now enjoying great popularity in China on the strength of the Korean wave. "Korean TV dramas, films, and music are hugely popular in China now," he said. "This is a good opportunity particularly for the small- and medium-sized Korean companies," he added. He argued that Korean businesspeople should meet the right people and should make the right connections for the successful business. "Business One Global Trade Center will be your platform for your successful business in China," Mr. Hwang went on. "International Buyers Purchasing Conference 2012" will also be organized in other places including Zhuhai in Guangdong Province, Shenzhen in Guangdong Province), and Nanning in Guangxi Province.